I am trying to replicate in Musescore the notation in the attached file original.jpg. I select Add, Tuplet, Other and set the ratio as 4 to 6. I can enter notes as either of the two bars shown in my attachment musescore.jpg. As can be seen if I enter all semquavers the value of the notes works correctly but if I enter the first note as a quaver I have a semiquaver rest left over! 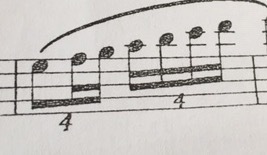 As far as I can see the two bars written in Musescore have the same time values but Musescore leaves me with an extra semiquaver if I start with a quaver! I tried using Add, Tuplet, Quarduplet but that doesn't work either. I have used a workaround by entering the second bar in my attachment and setting the spare rest as invisible but just wondered how to do the job correctly. Would be most grateful for a pointer as to where I am going wrong! Thank you. I have no problems entering that. Thank you cadiz1. Your solution looks perfect! So I tried your suggestion and entered the bar format in the order you suggested. However I still have the same problem (see bar 6). I saved the resulting mscz file but when I tried to upload it to attach to this message I received an error. quadruplets.jpg - a pic of the notes I entered. quadruplets.mscz - the saved Musescore file of those notes. 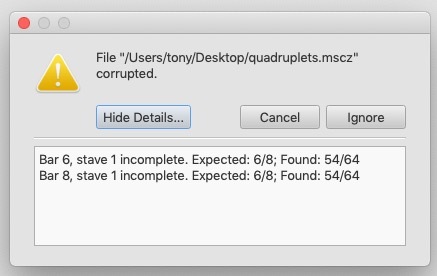 corrupted.jpg - a pic of the error I received when I tried to open that mscz file. 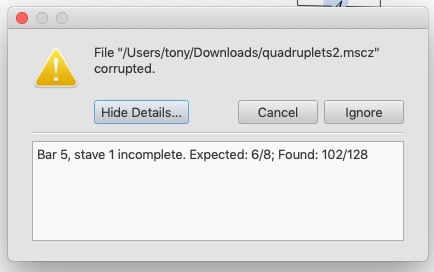 Also attached a screenshot of the Musescore error reported when I tried to open the quadruplets2.mscz after making the change. Edit: 3.0.5 apparently (but created with 3.0.5 or other?) Thanks to be precise. I'm changing the exact same rest to an 8th note E and it's working fine in the 3.1-beta. This leads me to believe the problem has been fixed already and the solution is an upgrade. Cadiz1 - Very many thanks for your kind attention and replies to this query. I look forward to the next 3.1 version. I forgot to mention amongst my grumbling that I find Musescore absolutely fantastic and this was such a small worry.